PLOT FOR THE SUN ALSO RISES—Tonight’s the night to shut off the TV, put the cat out and curl up with a good book. Problem is who reads anymore? Hmmm? How about curling up with a good synopsis of a good book. That’s better than nothing. THE SUN ALSO RISES by Ernest Hemingway. Published in 1926 by Scribner’s. The protagonist of “The Sun Also Rises” is Jake Barnes, an expatriate American journalist living in Paris. Jake suffered a war wound that has caused him to be impotent; the nature of his injury is not explicitly described in the novel. He is in love with Lady Brett Ashley, a twice-divorced Englishwoman. Brett, with her bobbed hair, embodies the new sexual freedom of the 1920s, having had numerous love affairs. Book One is set in the Café society of Paris. In the opening scenes, Jake plays tennis with his college friend Robert Cohn, picks up a prostitute (Georgette), and runs into Brett and Count Mippipopolous in a nightclub. Brett and Jake leave together; in a taxi she tells him she loves him, but they know they have no chance at a lasting relationship. In Book Two Jake is joined by Bill Gorton, recently arrived from New York, and Brett's fiancé Mike Campbell, who arrives from Scotland. Jake and Bill travel to Spain, where they meet Robert Cohn north of Pamplona for a fishing trip. Cohn, however, leaves for Pamplona to wait for Brett and Mike. Cohn had an affair with Brett a few weeks earlier and still feels possessive of her despite her engagement to Mike. Jake and Bill enjoy five days of tranquility, fishing the streams near Burguete, after which they rejoin the group in Pamplona, where they begin to drink heavily. Cohn's presence is increasingly resented by the others, who taunt him with anti-semitic remarks. During the fiesta the characters drink, eat, watch the running of the bulls, attend bullfights, and bicker with each other. Jake introduces Brett to Romero at Montoya's hotel; she is smitten with the 19-year-old matador and seduces him. The jealous tension among the men builds; Jake, Campbell, Cohn, and Romero each love Brett. Cohn, who had been a champion boxer in college, has fistfights with Jake, Mike, and Romero, whom he injures. Despite the tension, Romero continues to perform brilliantly in the bullring. Book Three shows the characters in the aftermath of the fiesta. Sober again, they leave Pamplona. Bill returns to Paris, Mike stays in Bayonne, and Jake goes to San Sebastián in northeastern Spain. As Jake is about to return to Paris, he receives a telegram from Brett asking for help; she had left with Romero for Madrid. He finds her in a cheap hotel, without money, and without Romero. She announces she has decided to go back to Mike. The novel ends with Jake and Brett in a taxi speaking of the things that might have been. 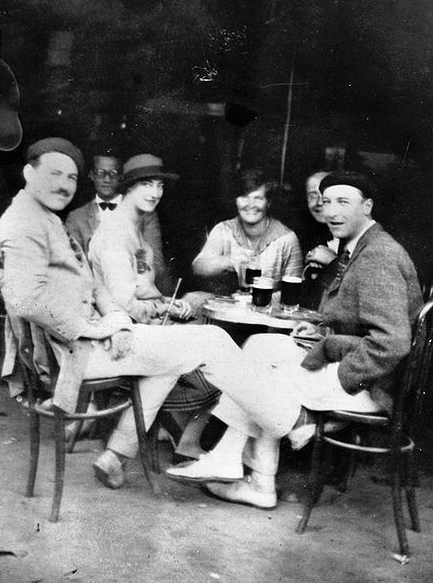 Left to right: Hemingway, Harold Loeb, Lady Duff Twysden, Elizabeth Hadley Richardson Hemingway, Ogden Stewart and Pat Guthrie. Reportedly, Hemingway left Spain with his wife and returned to their home in Austria, where he began writing “The Sun Also Rises.” It was published in 1926. SUNDAY REVIEW—A new online literary review appearing exclusively on Pillar to Post (www.tomshess.blogspot.com).